Are You Ready for The After at Quivira? 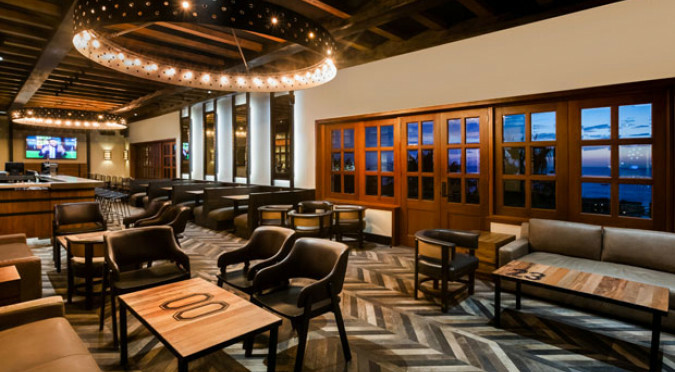 On October 26, 2018, Pueblo Bonito Sunset Beach debuted The After at Quivira, a cutting-edge modern sports bar. The After is located at the Market at Quivira, and is a fantastic place for guests and residents to watch all the most important, thrilling games and matches year-round—from NBA and NFL, to PGA and the Champions League, and more—in a luxurious and sophisticated environment that exudes urban chic. In addition to the signature craft cocktails, you may choose from over 100 different distilled liquors and 20 varieties of artisanal beers from the United States and around the world. The food is typical American bar fare—think juicy burgers, crisp salads, sumptuous sandwiches—with that added Pueblo Bonito zest that makes each of our restaurants anything but typical. In keeping with the urban chic aesthetic, the bar features high-speed Wi-Fi service throughout, along with ample chargers for cell phones. The terrace offers partial views of the ocean, and a private room is available by reservation. Best of all, the After at Quivira is included in the all-inclusive packages for Pacifica, Sunset Beach, Montecristo, Rosé, and Pueblo Bonito Los Cabos! Book your winter escape to Pueblo Bonito Sunset Beach Resort & Spa.